You know he’s there. So does everyone else. The torment on his face is palpable, a single tattered and blotted cover revealing pages of pain inside. She smiles a nervous smile, but isn’t fooling anyone – her eyes betray fear, rimmed red and silently crying out for help. Most of your friends, even believers, smile weakly in her direction and get through their “hellos” as quickly as possible. They retreat to their space and the comfort of less emotionally demanding friends. Some go out of their way to avoid the mess entirely. Don’t let this be you. Go to them. Not for the evening, the week, or whenever; go for as long as they need you. They can’t, and likely won’t, offer you anything in return. You won’t know what to do. You’ll be exhausted. You may get hurt, and you may not be thanked. The endeavor won’t earn you fame, wealth, or even satisfaction. To take on labor like this is to assume one of the most understated, but valuable of Christian virtues, compassion. Compassion literally means “to suffer with,” and those who are characterized by it are among the strongest, most godly of Christians. 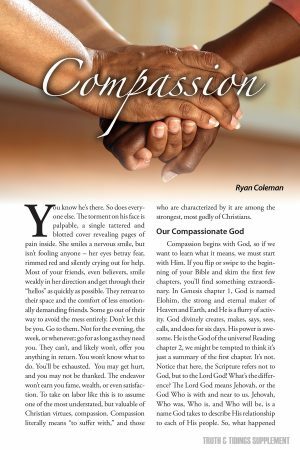 Compassion begins with God, so if we want to learn what it means, we must start with Him. If you flip or swipe to the beginning of your Bible and skim the first few chapters, you’ll find something extraordinary. In Genesis chapter 1, God is named Elohim, the strong and eternal maker of Heaven and Earth, and He is a flurry of activity. God divinely creates, makes, says, sees, calls, and does for six days. His power is awesome. He is the God of the universe! Reading chapter 2, we might be tempted to think it’s just a summary of the first chapter. It’s not. Notice that here, the Scripture refers not to God, but to the Lord God! What’s the difference? The Lord God means Jehovah, or the God Who is with and near to us. Jehovah, Who was, Who is, and Who will be, is a name God takes to describe His relationship to each of His people. So, what happened between the two chapters? You did! The eternal God of Genesis 1 is the personal God of Genesis 2. This fact, that God is a personal, loving, with-us God, is the foundation of our compassion. In Genesis 3, a very short time after Adam and Eve sinned, we see this in action. Adam and Eve have ruined God’s perfect creation and changed heaven and earth with a single bite. Even so, we find the Lord God walking in the cool of the day looking for them. “Where are you?” He asks. Everything is ruined. The wheels of time that will one day see God’s Son suffer for sin lurch forward, yet God still wants to be with us. Not to destroy or berate, but to be with us. Sin started with humankind and causes our suffering by separation, but compassion starts with God, Who suffers with us. No matter how difficult things get, He remains the Father of Compassion (2Cor 1:3), waiting quietly, suffering beside us, arms cradling our steps. Perhaps you’re more like the person in pain at the start of this story. Others cast weak smiles for you, and their whispers bring no comfort to your gloom. Beloved, He knows. He is always whispering, “Where are you?” from the lowest, thickest darkness. Philippians 2 isn’t a Bible passage for the faint of heart. In it, the Apostle Paul exhorts the Christians to serve each other in order to build a strong, compassionate fellowship. Don’t let anyone convince you that compassion, that suffering love, is for the weak. These relationships must run deep, and be full of the character of the Lord Jesus Christ. He “made Himself of no reputation, and took upon Him the form of a servant, and was made in the likeness of men: And being found in fashion as a man, He humbled Himself and became obedient unto death, even the death of the cross” (Phil 2:7-8, KJV). William Kelly calls this the lowliness of love. Emptied of reputation, the Lord Jesus Christ humbled Himself to suffer, moving among us in our sin. He didn’t come for a few hours and go back to His ivory palaces that night. He didn’t declare God’s love in a grandiose statement and return to heaven with blinding light. He came as a lowly man, and He came here to be with us. He touched our diseases when no one else would come near. He rolled up His sleeves and got muddy hands so we’d see. He helped our unbelief, and He cried real tears for God’s sheep without a shepherd. He lived and He died for us, going even to death on a cross. In God’s eyes, the cross defines compassion. The one Who suffers with us is the one Who suffered for us. Sin brought separation, pain, loneliness, weakness, and death, so the Lord Jesus went there for us, right to where the problem was. He knows. Beloved, God will never ask you to do something, to endure something, or to survive something that He Himself, in Christ, has not done. You might ask where God is. Why me? When is this going to end? But in your asking, you must know that God is right here, right with us. He will suffer with us each step of the way until there are no more tears or sorrows – until there is no more pain, death, or sin. Trust me when I say, from experience, He has never stopped whispering, “Where are you?” to those who are suffering. The verses in Philippians 2 that convince us of the compassion of the Lord Jesus Christ require great responsibility, too. Here and in other places, the strange phrase, “bowels of mercies,” is used to describe the compassion required of believers for each other (Phil 2:1). What could this mean? “Bowels” does not sound like a very nice word to associate with love. But the Scripture won’t fail us. This phrase is used to describe care that comes from the most inward part of a person; it is our deepest sympathies coming from the deepest of our feelings to a heart in need. Compassion is a visceral endeavor. We should love from the inside out, even to the point of looking like the compassion we feel. Put on, or wear your bowels of mercies, kindness, humbleness of mind, meekness, and longsuffering (Col 3:12). Truthfully, we all tend to prefer our charity on a schedule, giving a few hours early Saturday morning to feeding the homeless, dropping our change in a box at the checkout, or listening sympathetically to someone’s story over a muffin before Sunday school. These are certainly good things, but they fall far short of Biblical compassion. This may be because they are mostly about us and how we feel, or it may be because they expose the limits of how much we’re willing to suffer with others. But, if you’re willing to take up the challenge of compassion, it’s not going to be a flighty endeavor, or even one that fits your schedule. In 1 John, God teaches us that Christian fellowship is firmly grounded in truth and love. These two things are the keys, unlocking our true, full joy in God’s assembly. As he writes of the love of God, John the Apostle reminds us of that truth we learned, that God won’t ask us to go to depths where He, in Jesus Christ, hasn’t been. “Hereby perceive we the love of God, because He laid down His life for us: and we ought to lay down our lives for the brethren” (1John 3:16, KJV). When he speaks of “laying down our lives,” it’s not the idea of a single act, like taking a bullet for a fellow believer. Instead, try fitting the word “soul” in the verse. We ought to lay down our souls for the brethren. See the difference? Laying down my soul, the real me, for someone is going to take some time, even if it does take my life one day. For now, I might have to park my own convenience or miss spending time with my friends to help you. I might struggle with finding words to comfort. I might find just listening works better than talking. True, compassionate fellowship will take my time and my resources and give them to others, too. You may not have money, but you might have lunch. You can make a friend something they’d never buy. You likely won’t cure their cancer, but a service station gift card for that daily chemo trip helps. But “whoso hath this world’s good, and seeth his brother have need, and shutteth up his bowels of compassion from him, how dwelleth the love of God in him? My little children, let us not love in word, neither in tongue; but in deed and in truth” (1John 3:17-18, KJV). Before we power up and head out to meet the needs of our fellow Christians, let’s add one last look at the challenges of Philippians 2. “Look not every man on his own things, but every man also on the things of others” (Phil 2:4, KJV). This seems fine when we assume that we’re looking out for others, but what about when the camera focuses on us? We almost always push off help; our culture hates weakness. “No problem, I’m okay,” we say. But, that’s not what’s really going on inside. Beloved, God has given you the best of friends in the believers. He’s led some of them down deeper, darker paths than most of us will ever experience. They are charged by God and empowered by the Holy Spirit to suffer with all believers, even with you. When they call, open up, make room, and let them love you. One day, God’s servant paused outside Jerusalem. He scanned the scene from a distance, watching the people hurry about in every direction, but always away from Him. He cried for their souls, healed their sick relatives, and taught them in love, regardless of their hatred. Another afternoon, He fed 4,000 people, knowing that some would only remember the free lunch. The Lord Jesus is our example of service to the world, suffering with them, and expecting nothing in return. “For even the Son of Man came not to be ministered unto, but to minister, and to give His life a ransom for many” (Mark 10:45, KJV). Let’s do the same thing to this verse that we applied above, but trade the word “minister” for “serve” as well. For even the Son of Man came not to be served, but to serve, and to give His soul a ransom for many (Mark 10:45). It is remarkable how much the theme of compassionate, suffering service comes up in the Gospel of Mark. Write the word “compassion” on a bookmark and try reading the whole book with it in mind. In the first chapter, a man asks Jesus if He would be willing to heal him. “And Jesus, moved with compassion, put forth His hand, and touched him, and saith unto him, I will; be thou clean” (Mark 1:41, KJV). Later, another man cried out for a sick son, “but if Thou canst do any thing, have compassion on us, and help us (Mark 9:22, KJV). The Lord Jesus was both willing and able to do these things, pouring Himself into fulfilling the physical and emotional needs of others, even to those who would never admit their spiritual need, to show them the great heart of God. We don’t all need to be seasoned evangelists to bring the gospel to our desperate world; God will happily use our compassion to reach the lost. Many souls have been saved because someone was willing to invest a little in their lives each day. It’s a dirty, tiring business. But, if you’re willing to suffer with those in need, just listening, caring, giving, and suffering with them, you may find that their calloused heart cracks and opens to the gospel. Let God do the rest. Are you willing to take up the challenge of compassion? It’s likely you know someone in need right now. The accolades of the compassionate are few, but the rewards are everlasting. They aren’t based on results, but on relationships. Those who choose to pour out themselves and suffer with others share a piece of God’s heart and reflect the life of Jesus. Believers in anguish won’t ever forget it when you whisper, “I’m here for you.” Lost souls sick of sin may just see the Savior they need in your small act of kindness. God certainly will, too.